Given the developing uncertainty of the situation surrounding the Wenlock Arms in Hoxton (see earlier post ‘Save the Wenlock Arms, Please‘) we decided to start our evening there. We arrived just before 6 and there was a good crowd of people – perhaps more than normal but it was difficult to say. It was obvious that some in the pub were aware of the situation and when taking some photos (see Wenlock Arms photos here) I was asked if I was from British Heritage. When told that I wasn’t they were disappointed. 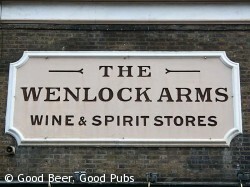 Jon and I stayed for about an hour soaking up the atmosphere (and the beer in Jon’s case) hoping this would not be our last trip to the Wenlock. After leaving the Wenlock we headed north over the Grand Union canal and up into Islington. 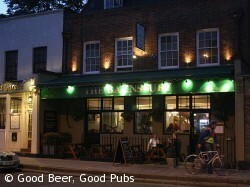 Our next stop was the Barnsbury pub on Liverpool Road, N1. I’d been alerted to this pub via Twitter (follow @thebarnsburypub) and it was good to finally get there and meet Steve, the new owner. Steve’s been in charge for about 10 weeks and has already transformed the place apparently. Sales of real ale are through the roof as Ian the cellarman takes great care of the beer, and he was proud to show us the clean and tidy cellar. Jon and I ate here and both had the pork cheeks for £13.50. They came served with a sauce on some mashed potato and they were delicious. I’m off the beer for medication reasons at the moment but Jon tells me that the Castle Rock Harvest Pale was superb and the O’Hanlons Stormstay deserves a mention too. We said our goodbyes and headed round the corner to the Drapers Arms in Barnsbury Street (also on Twitter at @DrapersArms). Jon tells me that this pub was boarded up for a substantial period of time when he lived in the area so it was good to see it reopened and with an attractive decor. The first thing you notice is the high ceiling and the spacious layout compared with the cosy feel of the Barnsbury. There were many people in and the atmosphere was lively. Food is available here too but obviously we couldn’t comment on that. Jon had a pint of Harveys Sussex Best which wasn’t bad at all apparently. We didn’t have much time left so we then headed off back down towards Angel. But we did visit one more pub before heading home – the Harlequin. The Harlequin is a tiny little pub in Arlington Way, EC1 – just behind Saddlers Wells theatre. I’d been here briefly before but it was new to Jon and we both like the relaxed friendly feel to the pub. I can imagine it gets busy at times with the theatre crowd but we managed to get a table without too much trouble. There are usually two real ales available and I’m told the Timothy Taylor Landlord was pretty good. There’s a piano at the back but we weren’t tempted, but if we’d stayed longer one of the many board games available might have been pressed into use. Another great night without a disappointing pub experience. Next post: Is it Hophead, or is it Hophead?